The streets of Solvang, Calif., hark back to the Europe of yesteryear. It is a great place for families, honeymooners or students wanting to get away from books and tests. Photo from Wikimedia Commons. Less than 200 miles from Cal State Fullerton, Solvang feels worlds away from Southern California. The city of about 5,000 is the largest outpost of Scandinavian culture in the state. But the diverse community also features a Spanish mission, outdoor recreation and even ostriches. Halfway between Los Angeles and San Francisco on the 101 freeway lies one of California’s most surprising tourist attractions: The Santa Ynez Valley, home to the small cities of Solvang, Buellton and Santa Ynez. For more than a century, the area has been popular as a weekend trip for the residents of California’s two metropolises. Far removed from the crowds and pollution of the city, the valley is most famous for one of the largest outposts of Scandinavian culture in North America. Solvang has had a Danish heritage since the early 1900s, when pastors and educators Benedict Nordentoft and Jens M. Gregersen bought almost 9,000 acres in the Santa Ynez Valley for a cultural enclave on the West Coast. The city would remain a cultural icon through the 20th century, attracting recognition for preserving Danish heritage during the Nazi occupation of Denmark and becoming a popular weekend destination with the rising popularity of the automobile in the 1950s. 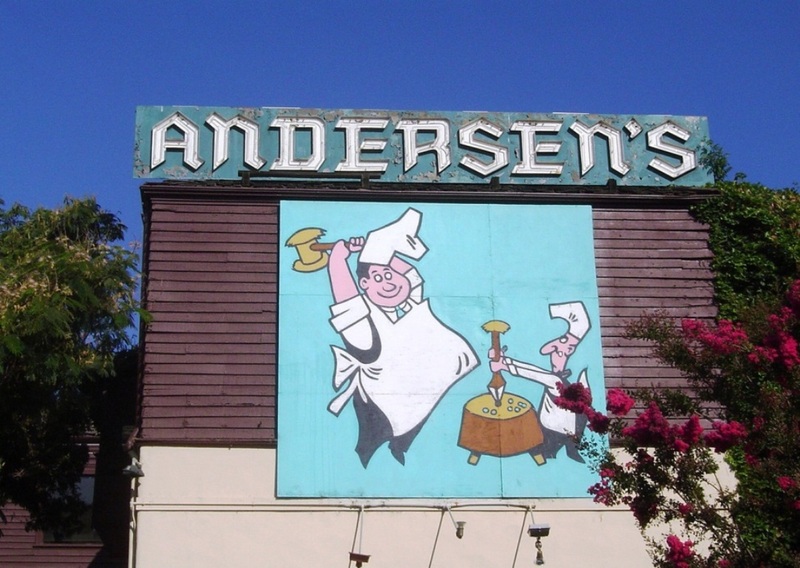 The sign welcoming visitors to Pea Soup Andersen’s in Buellton, which provides a taste (literally and figuratively) of Solvang, which is a few miles down the road. Photo by Daniel Coats. Today’s visitor is greeted with the windmills of Buellton, some three miles west of Solvang proper, at the Highway 246 exit on the 101 freeway. Take a left on Highway 246 and stop by Pea Soup Andersen’s, a restaurant, bakery, gift shop and museum that has been the delight of visitors since 1924. The restaurant is most famous for its split-pea soup, but there are also burgers and sandwiches, pasta and seafood dishes. Heading east on Highway 246, you soon arrive in Solvang itself. There are more than 150 shops and restaurants serving everything from traditional northern European faire to Asian and American cuisine. The district is very pedestrian-friendly, but you can always take a carriage ride to enhance your Old World experience. While Solvang is a year-round destination, the best Danish experience is during the annual Danish Days, which will be held this year from Sept. 16 to 18. Admission is free to activities such as the three parades, folk dances, artisans’ markets and Viking reenactments. Solvang’s Mission Santa Ines reminds us of the diversity of California. Who came first, the Danes or the Spanish? It’s debatable: The mission predates the Danish village by more than a century, yet historians believe that the Scandinavians, including the Danes, were the first Europeans to visit North America during the Middle Ages. Photo by Daniel Coats. But as in all California communities, the Santa Ynez Valley isn’t one-dimensional. Before Solvang was a Danish town, the area was home to one of the original 21 Spanish missions that dotted the coast from San Diego to north of San Francisco. Want to find out more about ostriches but don’t have the time or money to head up to Solvang? There are ostrich eggs right here on campus! At the Heritage House of the Fullerton Arboretum at the north end of campus, you can touch ostrich eggs, which are on display in guided tours of the 1894 home that was once the residence of one of Fullerton’s early medical doctors. The ostrich eggs are part of Orange County history, since the county once had ostrich races and even mail delivery by ostrich. Free tours of the Heritage House are offered Saturdays and Sundays from 2 to 4 p.m., except during January and August. Within walking distance of Downtown Solvang, Mission Santa Ines was founded in 1804, among the last of the missions to be built before the secularization decree of 1835. 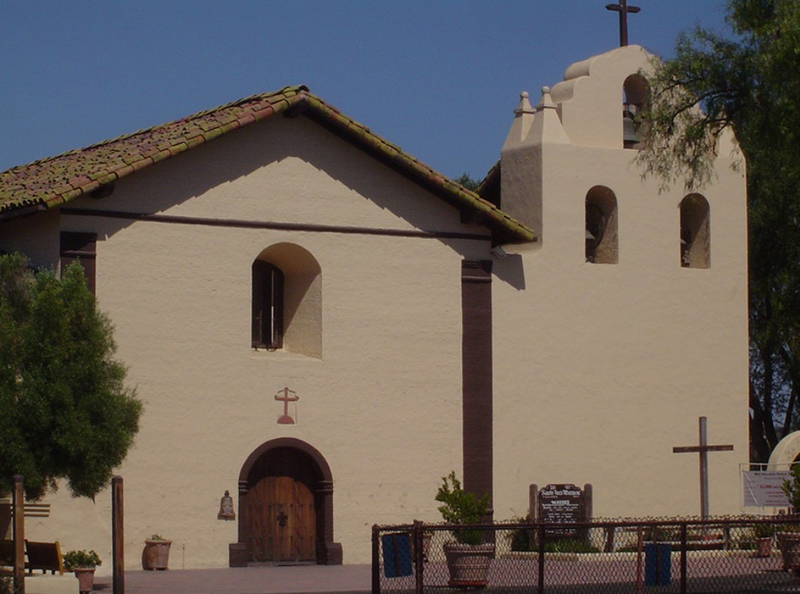 Yet the mission continued to make California history as the first institution of learning in the state (a Roman Catholic seminary in the mid-1800s). The mission contains some of the best examples of paintings and statuary from the period. Today, the mission is still an active church, and it welcomes visitors 9 a.m. to 4:30 p.m. daily, except major holidays. Admission is $5. 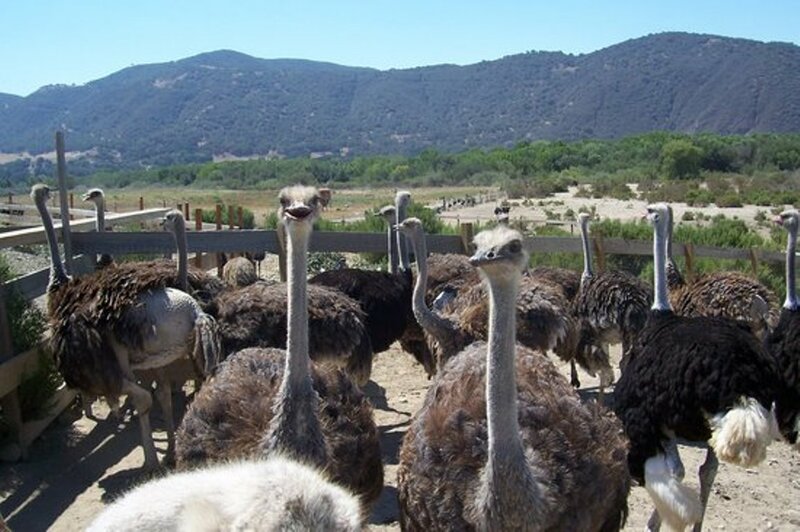 Heading back to Buellton on Highway 246, you can go from Denmark to sub-Saharan Africa with a stop at Ostrichland U.S.A. Open daily from 9 a.m. to dusk, adult admission is $6, which includes feed to give to the ostriches and emus. A gift shop sells memorabilia, including ostrich eggs. A gaze at a group of ostriches is an experience never to be forgotten. After feeding these birds, you can boast that you’ve “explored” two of the world’s continents in one day. Photo from TripAdvisor. The Santa Ynez Valley offers several outdoor recreation possibilities. Five golf courses, horseback riding and off-road vehicle areas beckon enthusiasts with an uncrowded place to enjoy a day of fun and sun. The Cachuma Lake Recreation Area, 12 miles east of Solvang, has a $10 vehicle day-use fee. The lake features a boat launch, tent and cabin camping and good fishing. However, the ongoing California drought has led to a sharp decline in the water level in recent years. Solvang and the Santa Ynez Valley is a destination in itself, or as a stop on the way to exploring Northern California. You might want to plan your trip carefully; a poorly-timed drive through the Los Angeles area can easily mean hours in traffic. Weekend mornings have the shortest travel times. The Santa Ynez Valley has a pleasant climate. While rainfall tends to be heavier than in Orange County during the winter, there are many beautiful days at all times during the year. Summer temperatures average in the low 90s, but nights cool comfortably to the 50s and humidity is much lower than we experience in Southern California. For more information, visit the Solvang Conference and Visitor Bureau online. You may order a print copy or view a digital version of the bureau’s annual visitor guide. 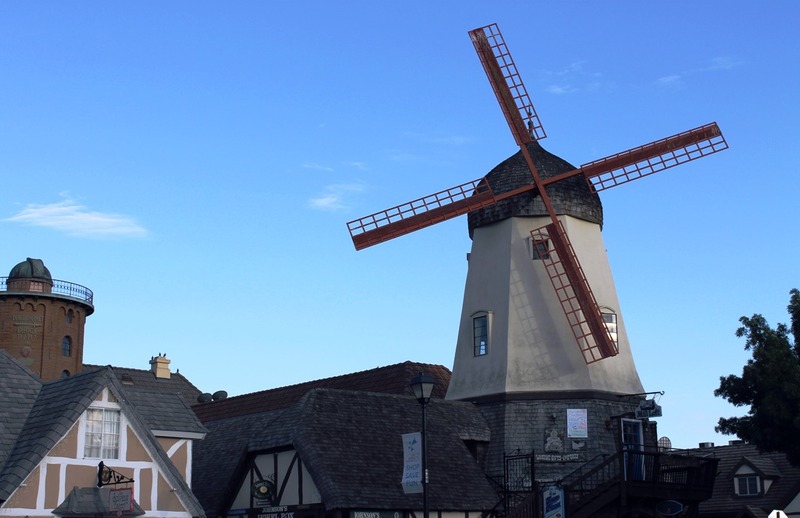 For more on the history and culture of Solvang, check out A History and Analysis of Solvang, California “The Danish Capital of the U.S.A.,” a thesis written by Paul Harris Pedersen ’94, a social science graduate from Cal State Fullerton. The thesis is available at the Pollak Library.